Showing 1 - 10 of 17 Products for Automatic Transmission Shift Lever Kit. Shift Lever Length (in. ): 12.120 In. 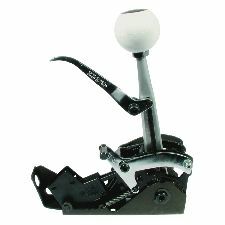 Features include NHRA/ IHRA reverse lockout, backup light switch, neutral safety switch, polished T-handle. Cable operated for quick installation and accurate shifting. For 2 and 3 speed applications.